Ayurveda resorts in Kerala, South India reveal a magical land of cooling massages, refreshing plant medicines, potent herbal therapies and experienced ayurveda therapists who examine and diagnose you and advise specific rejuvenating or curative therapies based on your metabolic constitution. Kerala is dotted with ayurveda resorts and a large number of these resorts are five star deluxe resorts that offer cooling ayurveda therapies. 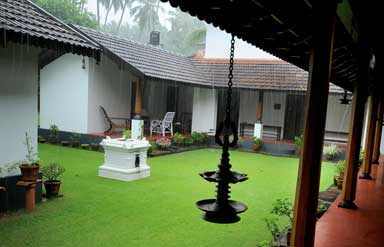 Most of these ayurveda resorts in Kerala, South India are located in isolated green spots surrounded by herb gardens, tropical trees, coconut groves and banana trees. The green, refreshing and clean ambience adds to the effect of ayurveda therapies and makes you feel younger, healthier and happier. 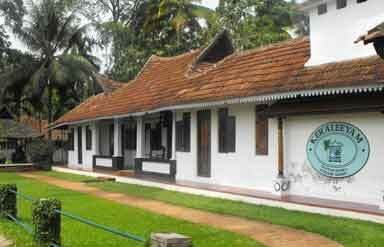 Some of the popular ayurveda resorts in Kerala, South India are the Keraleeyam Ayurvedic Resort, Kairali Health Resort, Kumarakom Lake Resort, Poovar Island resort, Somatheeram Ayurvedic Resort, Kayaloram Lake Resort, Spice Village Resort and numerous other big and small ayurveda resorts. Caper Travel India offers to book refreshing stays at the ayurveda resorts located in different parts of dense green Kerala, South India.